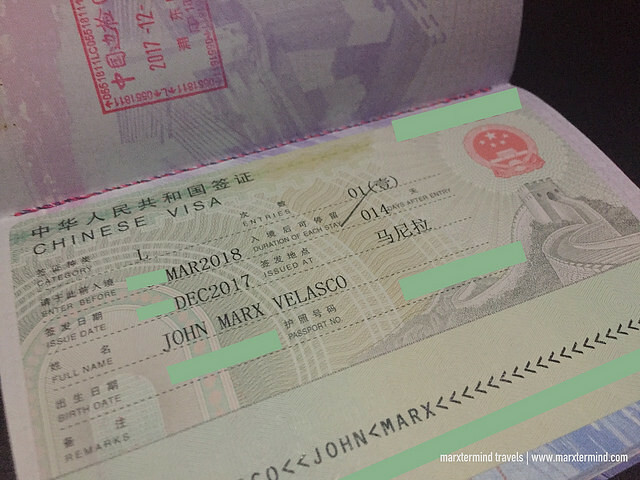 China is one country that I was hesitant to visit because I was under the impression that getting a Chinese tourist visa was elusive. Some said that visa requirements were strict and I needed around 6 digits worth of savings in my account to successfully get a tourist visa. Also, because of some of the negative things that going on between China and the Philippines, I somehow lose my interest to travel to China. But China is a huge country that offers so much to visit and explore. It is blessed with plenty of amazing tourist attractions and beautiful places to see. Explore ancient cities, temples and stunning natural wonders. China is also home to many UNESCO heritage sites. It’s also on my bucket list to see the Great Wall of China. So sooner or later, I’ll see myself visiting China. And so when I chanced upon a promo fare for flight to Beijing when I was looking for a destination to go during the holiday season, I didn’t think twice anymore and booked the ticket right away. After receiving the confirmation of my plane ticket, I then checked online the steps on how to apply for Chinese tourist visa. I got excited that I already read some blogs even though it was still three months before my trip. There are actually a lot of resources available online. Then, I learned that it wasn’t that really difficult to apply for Chinese tourist visa. The requirements are pretty easy than I thought. How to Apply for Chinese Tourist Visa? Passport – Original passport that is valid for at least another 6 months with at least one blank visa page. Also give a photocopy of the passport’s bio page and emergency contact page. Submit the previous old passport as well if available. If the old passport is lost, or the applicant never holds a passport before, please make a clear statement in the item 3.7 of the visa application form. Photo – Two recent colored photos with white background. Affix one of the photos on the application form. The photo should be in 48mm x 33mm size without head covering. Stapled, taped, clipped or detached photos will not be accepted. Roundtrip Ticket – Proof of booked roundtrip airline ticket. Travel Itinerary – Write travel itinerary in the designated spaces on the application form. Indicate the dates, activities and places to visit. Use a separate sheet if needed. Invitation Letter – Invitation letter only if staying at a friend’s house or with relatives. Also present the photocopy of the inviter’s Chinese ID or Passport with Chinese Residence Permit. Certificate of Employment detailing the salary, length of employment, name and office address. When all the requirements are ready, go to the Chinese Embassy and submit the documents in person or through travel agency. Appointment is not required. Visa application is only from 9:00 AM to 11:00 AM, Mondays to Fridays except holidays. Processing time is 4 days. Applying for a Chinese tourist visa wasn’t really that difficult. I think the only agonizing was the warm temperature in the embassy and the hours of waiting to submit the documents and to claim the passport. But generally, the process is easy and straightforward. I submitted all the requirements and I was approved for a single entry visa. I’m glad that I was already able to visit China and tick one item off my bucket list, to see the Great Wall of China. I had a great time in the country. Because of that, I think I’m going to see myself visiting China again. 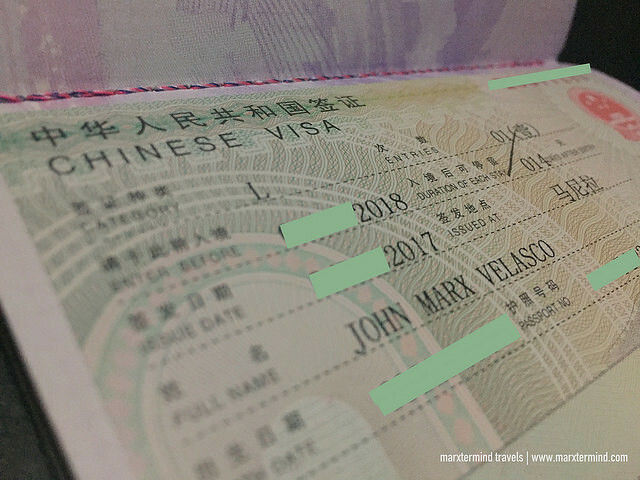 When is the best time to apply for Chinese Tourist Visa? I suggest two to three weeks before the trip. I applied mine three weeks before my flight. Do I need to have a show-money? Yes. Applicant must submit bank certificate and bank statement. How much should be the show-money? Before I thought I needed at least Php100,000 in my savings account to apply for Chinese tourist visa. But when I submitted my financial documents, I have less than that amount. My bank can only issue 3 months worth of bank transaction. Can I submit bank certificate and bank statement showing 3 months of transaction instead? I can’t totally say yes but in my case, I only submitted 3 months worth of bank transaction. Apparently, it takes two weeks for the bank to issue bank statement with 6 months worth of transactions. I didn’t have much time to wait for the bank statement showing full 6 months so I just submitted whatever is available. Can I submit Form 2316 instead of BIR-stamped Income Tax Return form? Yes, this is the one that I submitted to the Chinese embassy. If the applicant is an employee, request it from the company HR. Please note that steps provided in this blog are for first time application for a Chinese tourist visa only. If you are traveling to China for study, transit, work or business, please contact the embassy or visit the official website.